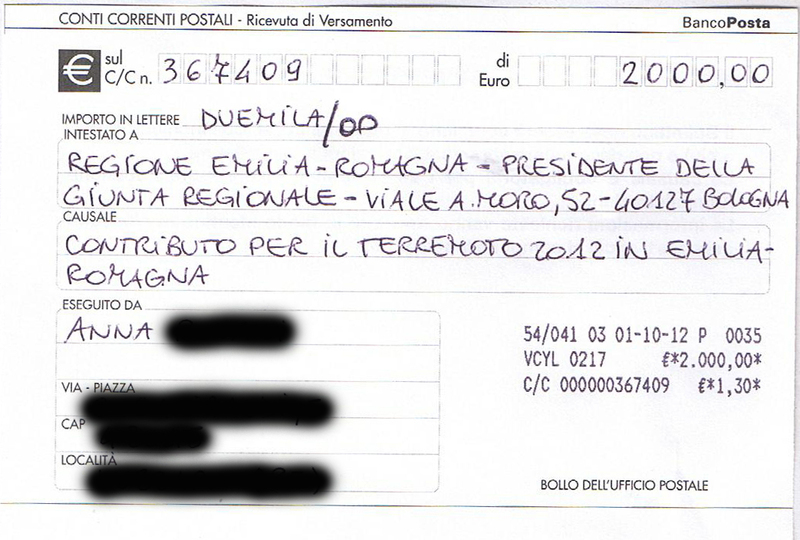 I’m finally happy to show you the receipt of the donation to the Emilia-Romagna region account to benefit the victims of the earthquake in Italy. My heartfelt thank you to all of you for supporting this project that means so much for me and all the Italian people who lost their houses and dear ones in this tragedy. I don’t have enough words to thank you and express my feeling in this moment. I’m touched by all the generosity I’ve seen during this event and I’m sure the money we have been able to raise together will make the difference for those who most need them in this moment. 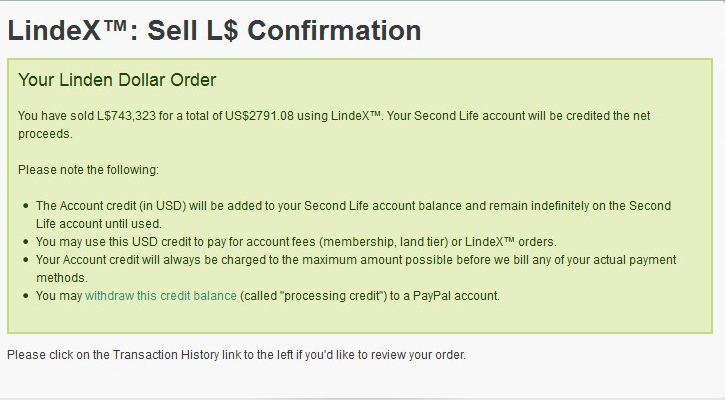 Lindens transfer to my PayPal account is completed. 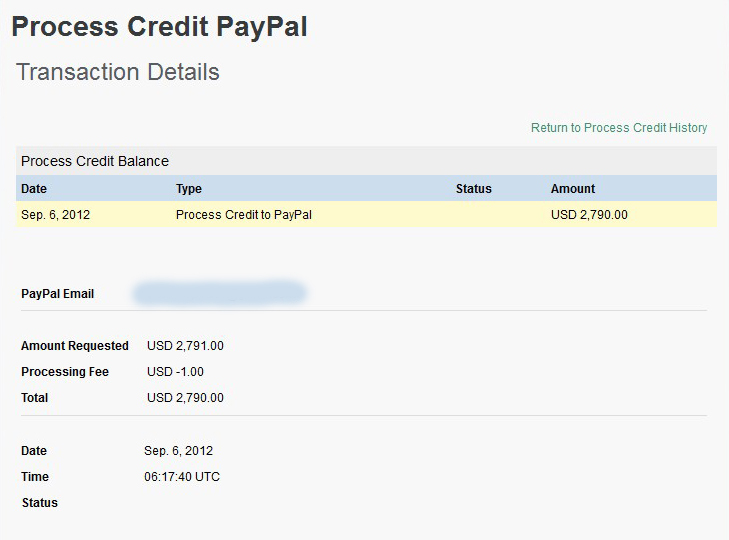 I just sent part of the money from PayPal to my credit card. 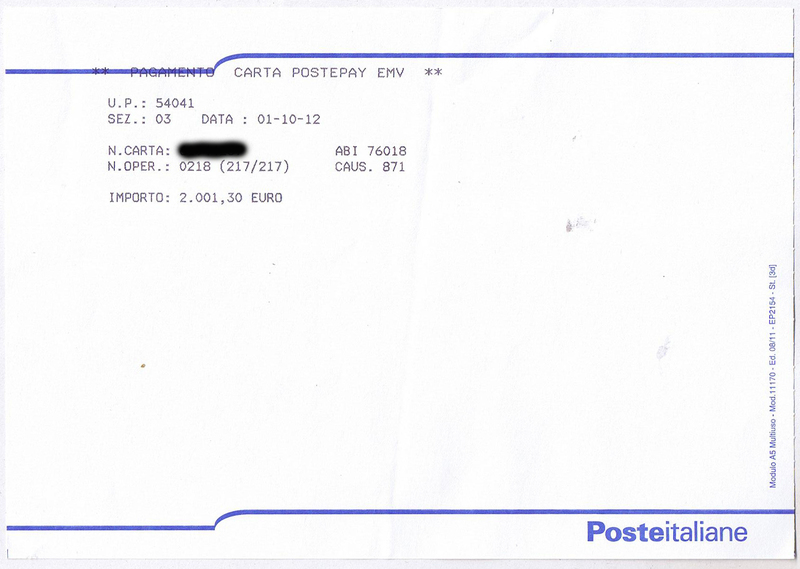 I couldn’t send everything today because there is a limit of 1.000 euros per time. 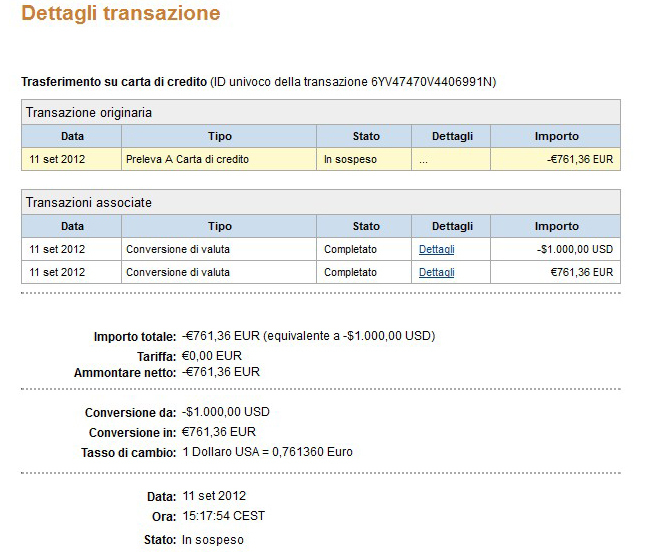 It will take max 2 days to have this first transfer on the credit card, and then I will be able to transfer other money. I hope to have all the money on the credit card in max a week. I can’t wait to make the donation! 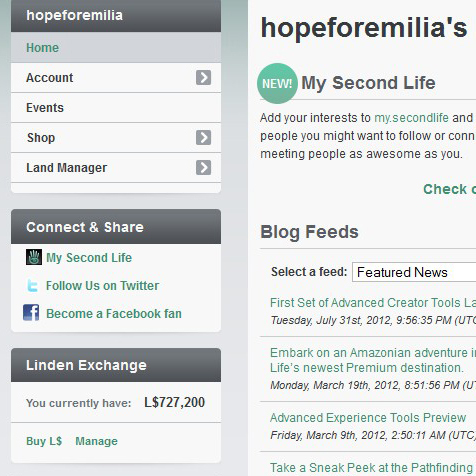 I transfered all the L$ raised so far with Hope For Emilia to my PayPal account today. 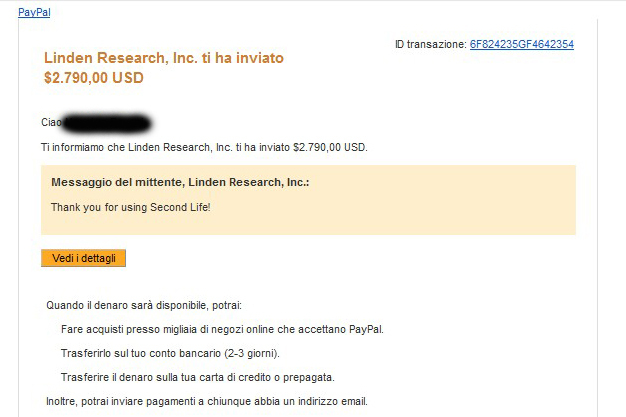 It will take more or less a week to get the money on my PayPal account; as soon as I get them, I will be able to make the donation to Emilia-Romagna bank account. I will post every update on this blog. 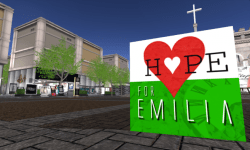 Hope For Emilia sim is closed but if you want to donate to the cause you can still do it! Many designers agreed to keep their exclusive creations as 100% charity items in their stores and our donation box as well. With your help we will be able to make other donations to support the victims of the earthquake in Italy during the year. Hope For Emilia closed yesterday and I’m happy to announce that we raised L$ 727,200 (USD 2944.13). (You can find HERE the complete list of all the transactions). I remind you that many designers (I will post the list later today) agreed to keep the exclusive items in their stores as 100% charity items, as well as donation boxes. This way we will be able to make other donations to the victims of the earthquake during the year. 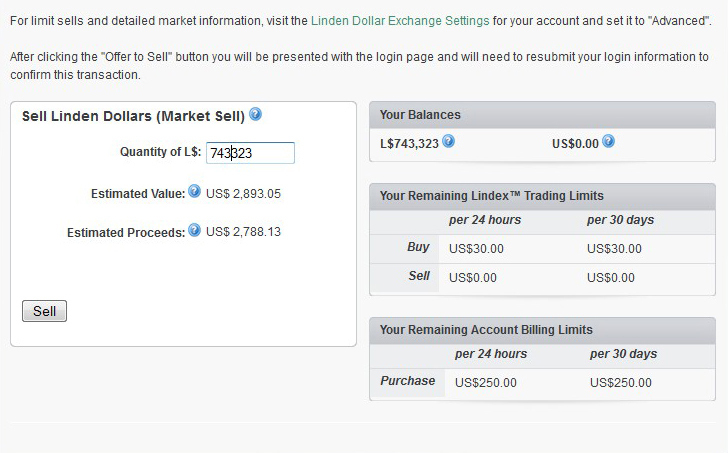 Again, every transaction will be registered and shared on this blog. I would like to personally thank all the people who supported this cause. Thanks to ALEXANDAR VARGAS for his donation of the sims for this event, and to Setsuna Infinity for his amazing built and assistance. Thanks to Terrilynn Carami for her help during the whole event. Thanks a lot to Datrip Blackbart, Manon Clary and ENERGY CLUB staff for their fabulous “24 hours 24 DJ’s” event and for the closing party. Thanks to Brittainy Collins and MIM – MODELS IN MOTION for their spectacular dance show, and thanks to BLVD AGENCY models for the fashion shows. Thanks to Monica Outlander for her help to start this event. Frolic Mills, Persia Bravin, Cottoncandy Teardrop, Rusch Raymaker, Agtaope Carter, Topaz Joubert, Ji Nirvana, Leah McCullough, Zachary Zufreur, Mimmi Boa, Ellendir Khandr, Merrick Genesis, Ricoracer Flux, Cenedraflame Resident, Aliza Karu. And to all the wonderful bloggers who helped advertise Hope For Emilia! Thank you very much to all the shoppers and supporters who contributed in different ways to the cause. Sponsored by Legal Insanity and Energy Club, this will be the coolest party of the year! From 2 pm LIVE AUCTIONS! Hosted by Miss CottonCandy Teardrop, you will have the unique chance to win one of a kind prizes! Thank you very much CenedraFlame Resident for this beautiful interview and feature on your blog. 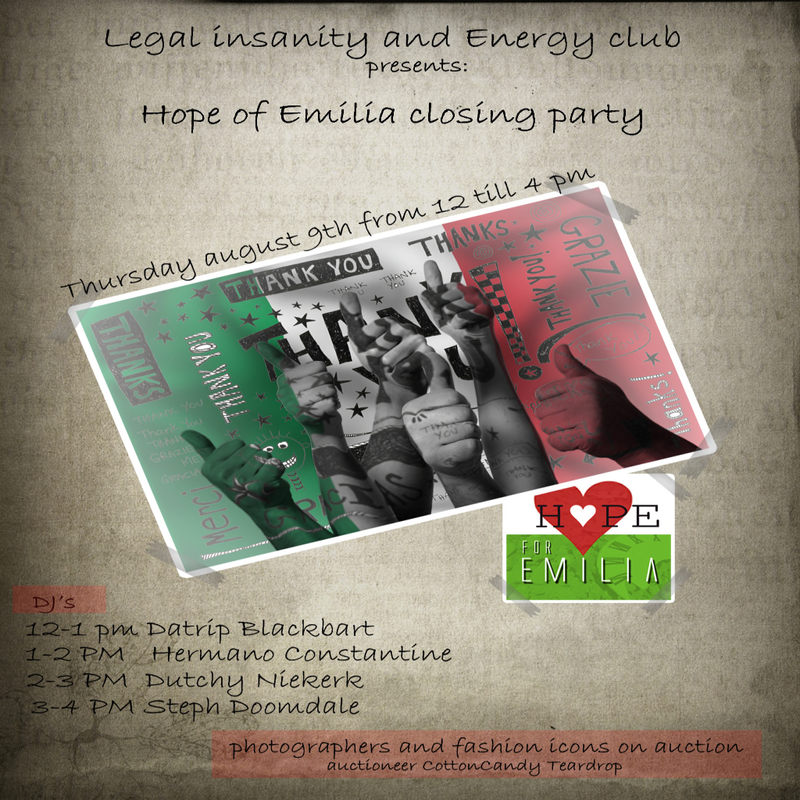 Hope for Emilia, held through August 9, is a fundraising event for the victims of the recent earthquake in Emilia, Italy. Activities include a Summer Fashion Fair, fashion shows and an art expo. More info at https://hopeforemilia.wordpress.com.